Watch Tv Now is a browser hijacker that keeps you from using the browser normally and tracks, collects and shares information about you. Check the system for additional cyber infections and unwanted programs that can be installed without your permission. Watch Tv Now is a suspicious search engine that tracks information about users and shares it with third-parties. 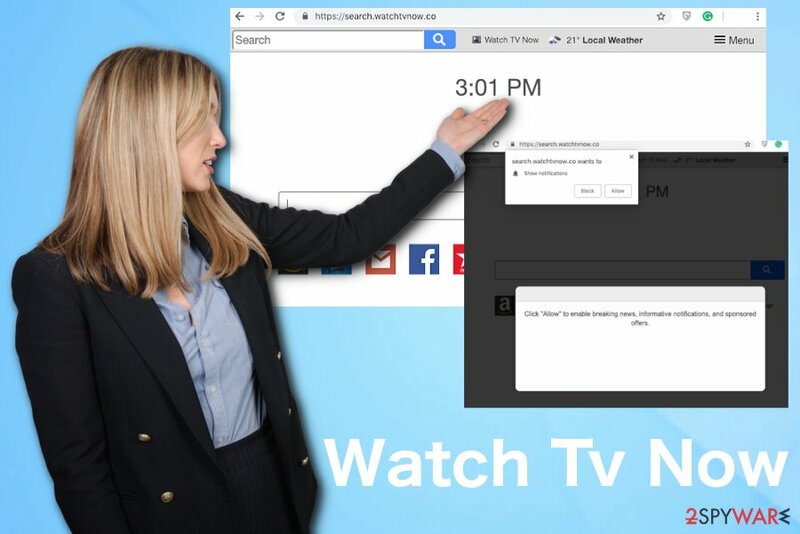 Watch Tv Now is a useless search tool created by the company creating tons of potentially unwanted programs – Polarity Technologies Ltd. This movie-themed search engine is classified as a browser hijacker and potentially unwanted program because of its ability to enter the system silently, alter targeted browser’s settings, spy on users and deliver commercial content based on gathered data. There’s no need to let this program stay on the computer. However, it might be a challenge to remove so-called Search.watchtvnow.co virus. This PUP might be capable of altering shortcuts, creating Registry entries or even installing browser helper objects that allow controlling affected browser. There are tons of similar websites or browser extensions, toolbars that work similarly and can be installed by this cyber threat without your knowledge. Employ reputable tools and scan the system thoroughly to remove all possibly associated programs. Polarity Technologies has released numerous similar tools that have different themes and promote various programs, websites or other services. Search.watchtvnow.co offers quick access to Netflix, Hulu and other sites that allow watching movies or TV shows. What is more, users also can use shortcuts to Amazon, Gmail and Yahoo email services. Unfortunately, it’s the only useful feature of this search tool. Watch Tv Now browser hijacker is the program that shows errors on its useless website. redirects to commercial or affiliated pages. 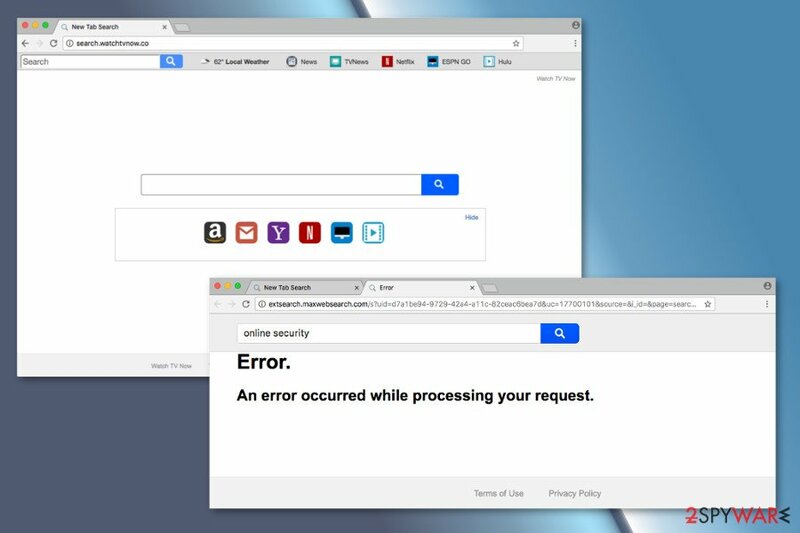 The hijacker is interested in browsing-related details, information about your browser and operating system, IP address, email address, and even home or work address. All this information is not only used for behavioral marketing strategy but also for sharing or selling it to third-parties. Thus, you can only imagine what might happen if this data ends up in the hands of criminals. In order to avoid privacy-related issues, you should remove Watch Tv Now immediately. It is advisable to use reputable PC repair tools or antivirus programs for Watch Tv Now removal. Security experts recommend employing Reimage for the job. The full system scan gives an advantage of seeing every intruder that needs to be removed from the machine. Watch Tv Now is a potentially unwanted program that continues to deliver intrusive commercial content from the initial infiltration. The fake tools or search engines might be offered to install along with other application, and freeware or shareware. Developers are using the bundling technique that allows adding this PUP as an optional component in the software package. Incorrect installation of free programs may lead to the hijacked browser and allow other suspicious applications to enter the system. By saying “incorrect” we have in mind “Quick,” “Recommended,” or “Standard” installation settings. They do not openly disclose about third-party software and usually installs it by default. In order to prevent cyber infections and stop other PUPs from being installed on the computer, you always have to install new software using “Advanced” or “Custom” settings. At the beginning of the article, we have mentioned that there are two Watch Tv Now removal methods – manual and removal. If you are thinking about manual elimination option, you will find the instructions below handy. By following them, you have to locate and delete all hijacker-related entries from the PC and web browsers. However, since there is a possibility of additional changes you may not get the wanted results immediately. For this reason, you should opt for the automatic option. To remove Watch Tv Now completely in this way, you have to run a full system scan with a reputable anti-malware program. We can't recommend this method enough because a full system scan improves the general performance of your device while terminating possible intruders. 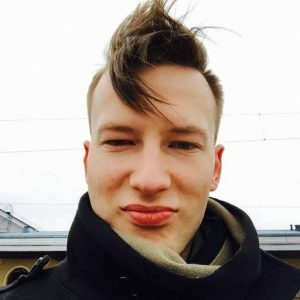 Follow the steps below to remove Search.watchtvnow.co from the computer manually. It's important to delete all hijacker-related entries from the system in order to prevent from re-hijack. Here, look for Search.watchtvnow.co or any other recently installed suspicious programs. Uninstall all suspicious applications that might be related to the hijacker. The guidelines below will help you to do it. Wait until you see Applications folder and look for Search.watchtvnow.co or any other suspicious programs on it. Now right click on every of such entries and select Move to Trash. From the list of add-ons you have to uninstall suspicious entries. Then reset IE as shown below. When in the new window, check Delete personal settings and select Reset again to complete Search.watchtvnow.co removal. The instructions below will help you to remove all hijacker-related entries entirely. Once these steps are finished, Search.watchtvnow.co should be removed from your Microsoft Edge browser. In order to get rid of Search.watchtvnow.co, you have to uninstall unknown extensions and reset Firefox. Here, select Search.watchtvnow.co and other questionable plugins. Click Remove to delete these entries. Now you will see Reset Firefox to its default state message with Reset Firefox button. Click this button for several times and complete Search.watchtvnow.co removal. Removal of the Watch Tv Now hijacker consists of two steps. Firstly, you have to uninstall suspicious extensions. Secondly, you have to reset Chrome. Here, select Search.watchtvnow.co and other malicious plugins and select trash icon to delete these entries. Click Reset to confirm this action and complete Search.watchtvnow.co removal. 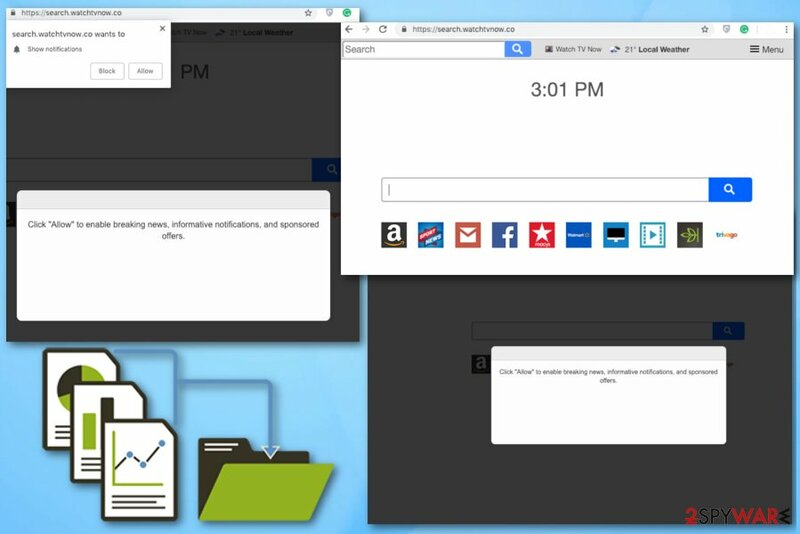 Follow the steps below to delete this browser hijacker entirely. Don't forget to reset Safari because it's a crucial step to delete tracking cookies! Here, select Extensions and look for Search.watchtvnow.co or other suspicious entries. Click on the Uninstall button to get rid each of them. Here, look at the Homepage field. If it was altered by Search.watchtvnow.co, remove unwanted link and enter the one that you want to use for your searches. Remember to include the "http://" before typing in the address of the page. Now you will see a detailed dialog window filled with reset options. All of those options are usually checked, but you can specify which of them you want to reset. Click the Reset button to complete Search.watchtvnow.co removal process. ^ Tony Bradley. What Is A BHO (Browser Helper Object)?. Lifewire. The website about technology and gadgets. ^ Michael Sweeney. What Is PII, non-PII, and Personal Data?. 7 Suite. Data Management Platform. This entry was posted on 2019-01-07 at 08:48 and is filed under Browser Hijackers, Viruses. You can quickly scan the QR code with your mobile device and have Search.watchtvnow.co virus manual removal instructions right in your pocket. How did you remove Search.watchtvnow.co virus?